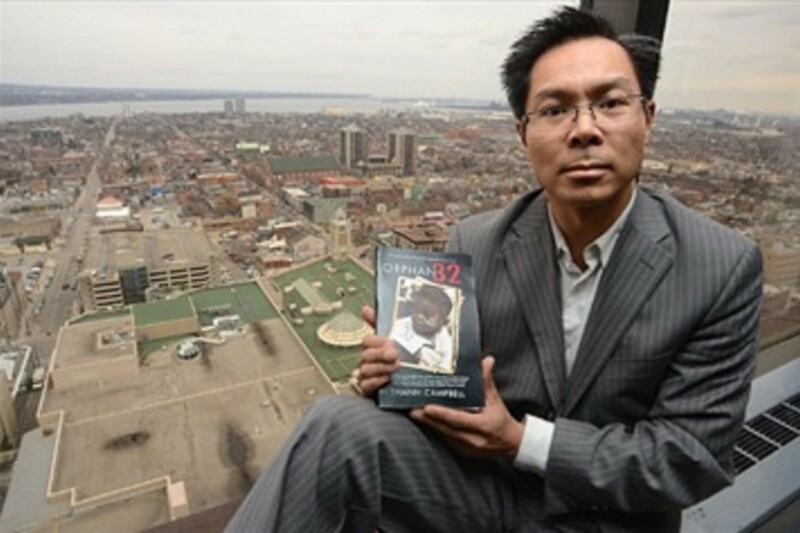 Thanh Campbell holds his book, Orphan 32. Thanh Campbell was born in Vietnam and came to Canada as part of the last flight out of Saigon in 1975 with 56 other orphaned children. Thanh was adopted into the family of the Rev. William and Maureen Campbell. Thanh became the youngest of the six Campbell children. In the recent past, Thanh reunited with many of the children who flew back with him in 1975 as war orphans. This milestone in his life was captured numerous times in the media. Invited to be a guest on such programs as CBC News, TVO Canada AM and 100 Huntley Street, he has had the chance to share his life story with the Nation. The 57 Orphans’ story was covered by many newspapers including the Toronto Star, Hamilton Spectator, Ottawa Citizen, Vancouver Sun, and Saigon Newspaper and was included in the French Consulate Newsletter. Most recently, Thanh has written his autobiography entitled Orphan 32. As the next chapter of Thanh’s life unfolds, you are cordially invited to hear his amazing story pertaining to the value of family, life and the power of love. Thanh has been invited to speak to numerous groups, churches and schools across Canada as a keynote speaker sharing his story of coming to Canada. Lunch is included with a choice of “vegetarian” or “meat” dish. Please e-mail our office at info@ichm.ca if you have dietary restrictions. Early Bird registration fee before April 20, 2016 for ICHM members, $50 per person. | Regular fee for ICHM members, $70 per person. Early Bird registration fee before April 20, 2016 for non-members, $65 per person. | Regular fee for non-members, $85 per person. Registration deadline: In order to accommodate demand, the registration deadline was extended to May 10, 2016.